George Kyalo sits outside the World Vision Kenya offices in Tseikuru, Mwingi North in Kitui County. He just finished a mentorship session here, a day before he goes back to the capital city for his studies. Kyalo, 22, is a beneficiary of the World Vision Kenya training and mentorship programme on child protection that he underwent in 2012 when he completed his primary education. He sits calmly under a tree, seemingly lonely and in deep meditation. “This is my lifestyle. Many times, I have learnt to stay alone, to figure out my next move in my work,” he explains. The now Education student at Riara University equates his job to that of a secret investigator. “My work since 2012 is to reduce child abuse, early marriages and female genital mutilation in this area. But I have to do it secretly or else I will be at war with the community, or even my own family” he reports. Since 2012, Kyalo has rescued six girls from early marriages and female genital mutilation. He is optimistic that in the next five years, he will eradicate any form of abuse against children. “My target is to eradicate any form of violence in this area. That is when I will say I have succeeded in my work. It is my joy to see children in their safe places,” says Kyalo. To the 22-year-old, having been brought up in an unstable family motivated him to move on with his campaign against child abuse. “I was not abused as a child. But I lacked the basic needs that a child would need in order to live a happy life. I did not want this life and that is why I am fighting to have children live decent lives,” he says. 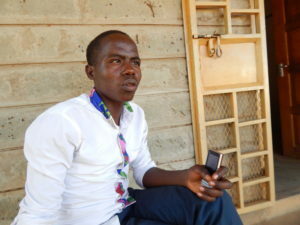 Since he started his child protection activities, Kyalo’s life has taken a different turn. He has learnt to select friends selectively and carefully. “I only have three close friends. I call them my spies. The three help me with my ‘undercover work’ for rescuing children from any form of abuse.” Kyalo opines that it is only that way that he can do his job effectively and without being noticed. “Sometimes, a parent who is engaging a child in harsh labour or wants to marry them off, would be angry at me if I stopped his plans. This is why my life is in danger. But I will not be afraid,” vows Kyalo. In 2014, Kyalo reported a child marriage case to the children’s office in Kamali village, Kyuso district. This led to the arrest of the parents and the man who was to marry the girl. Notably, many children in the area are also victims of child labour as their parents engage them in making local brew, locally known as Marwa. Child Protection Report (2006-2016), a report by Childline Kenya and the Government of Kenya reveals that 3123 children were subjected to child labour between 2006 and 2016. Such children end up missing school while others are exposed to early drinking and indecent behaviour by revellers. Kyalo works in a well-coordinated network with his three confidants, the police and child protection officers. “I have also learnt to stay close to pupils in the area. This way, I have gotten useful tips on child abuse cases,” says Kyalo who volunteered to teach in a local primary school early this year. This is how he rescued a Class Seven pupil who was scheduled to get married in Kakungu village in Tseikuru. He urges fellow young people to strive to leave notable change in their communities. “Be a dependable young person, one that can bring transformation in his or her community,” he advises. According to Childline Kenya, there were 33,929 reported cases of child abuse in Kenya between 2014 and 2016.Between 2006 and 2016, there have been 7,317 reported cases of physical abuse on children.